Available 365 days a year, long term contract or short term ad hoc business - no order too large or too small. 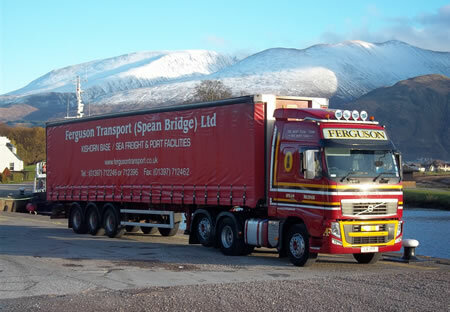 Ferguson Transport was founded in 1959 by the late Archie Ferguson with his wife Anne in Ardrishaig, Argyll. Archie’s uncle, Andrew Grindlaw was the first haulage contractor in Ardrishaig and operated horse-drawn carts and coaches in the early days. Archie worked with his uncle for some years after he completed National Service, before starting out on his own. Farm feed, forestry and general haulage were the typical types of transport carried out in the early 1960s. Ferguson Transport played a major part in clearing up the large wind blow in the late 1960s in Argyll, and subsequent to this when the forestry work dried up in Argyll, Ferguson Transport then moved to Lochaber in 1974 to load and unload ships at the Corpach Basin for Wiggins Teape Pulp and Paper Mill. Work at the time also included the transport of raw materials such as round wood and paper pulp and the deliveries of finished products, as far afield as Ireland via Campbelltown. One of the original founders of Ferguson Transport, Archie Ferguson, was tragically killed whilst assisting with the recovery of a loaded vehicle stuck on a forest road in 1997. Anne Ferguson retired from the business at the end of 2004 after 45 years, and the company is now run by four of Anne and Archie’s children: Group Managing Director, Alasdair Ferguson, and Group Directors, Leslie Innes, Carol MacKinnon and Jack Ferguson. Stemming from one single truck in 1959, Archie’s pride and joy, the Commer Two-Stroke, the road fleet gradually grew throughout the years, encompassing niche markets such as Skyline Harvesting for periods of time. In the early days, Archie Ferguson and son Jack were heavily involved in building and modifying vehicles and trailers to meet the needs of the company. In the early 90s, Archie and Jack together designed and built a mobile crane suitable for loading and unloading ships and lorries with round wood. The crane, which had a longer reach than “off the shelf cranes” affectionately became known as “Timber Jack” and was the starting point for a range of cranes modified by Jack Ferguson. One of the trucks is still kept in operating condition today almost 30 years after it joined the fleet and it was showcased again at Truckfest 2015. The road fleet is now upward of 70 trucks; with a mostly Volvo fleet, but also including Scania and MAN trucks. In 2014 alone 15 brand new Euro 6 trucks were purchased. The new Euro 6 truck by Volvo operates with the most stringent European emission standards to date. In 1998, Director, Alasdair Ferguson saw an opportunity to revolutionise the way fish feed deliveries were carried out at the time. Lorries would often have to travel down narrow, single-track, unsuitable roads to reach fish farms. Ferguson Transport then came up with logistic shipping solutions to provide the delivery service more efficiently, working with our clients to provide the best end results for them. Ferguson Shipping was then born and shipping operations began, firstly carrying out sea trials, and then we chartered a ship to operate on the West Coast of Scotland. In 2004 we purchased our first vessel, the Harvest Anne, and operations grew from there to the six vessels currently in the fleet today. Most of the vessels are double-barrelled named, after the founder member of the company, Anne Ferguson, meaning that the end name of each vessel is Anne. The first part of each vessel is then named after another female member of the family. For example the Leslie Anne is after Anne Ferguson’s daughter, Leslie Innes, and the Jodie Anne and Carhie Anne are named after Jodie Ferguson and Carhie Mackinnon, Anne Ferguson’s grandchildren. The company currently carries out approximately 90% of fish feed deliveries by sea, via port and warehousing facilities at Kishorn Port and Mallaig Port. In 1999, whilst looking for a suitable port facility to run the company’s Shipping operations out of, Group Managing Director, Alasdair Ferguson remembered a visit he had made to Kishorn Port with his father years before. Alasdair went to visit the Port, and found it the perfect place to base Ferguson Shipping and serve the needs of the industry. The port was originally constructed in the 1970s as an oil platform manufacturing yard and by the early 90s was no longer operational. Ferguson Transport & Shipping moved on site in early 2000 and has since made significant investments to integrate freight services and cut down road miles particularly in rural areas where the road infrastructure is very fragile and lacks sufficient investment or available funds for major improvements. The port is ideally located centrally to Ferguson Transport & Shipping’s operations on the West Coast of Scotland. In 2012 Ferguson Transport & Shipping offered a new logistic solution in integrated rail transport to take freight off the roads helping to increase road safety, decrease congestion and reduce CO2 emissions. Numerous trials were carried out in 2011/12, with products including sawn timber, aluminium and fish feed trialled for onwards delivery by rail. Our long term goal is to develop an intermodal hub at Corpach, reducing road freight by millions of miles per annum off the notoriously bad A82 road via modal shift. Ferguson Transport & Shipping are very pleased to announce our purchase of Skye Transport (Crossal) Ltd on 1st March 2015. Ferguson Transport & Shipping will continue to provide the same high standard and service that the Skye Transport team have delivered over the years. Please contact our Head Office for further information.